David Jerome Rollins was born September 2, 1907, in Kansas City, MO. His family moved to Hollywood when he was 14, but he continued to have a normal life going to high school, graduating in 1925, working briefly at a bank, and spending some time in the army. In 1927, he lived with his sister who did extra work in films. 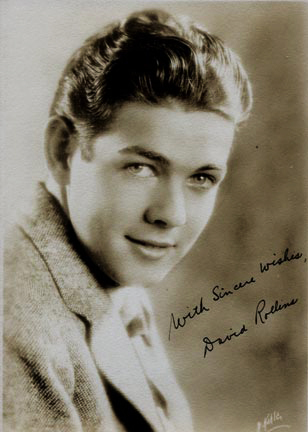 This resulted in some extra work, most notably in "The Collegians" series, until he was noticed by Fox production chief Winfield Sheehan, who, based on Rollins' good looks, signed him to a contract. He only made seven silent films of which "Riley the Cop" (1928) and an uncredited appearance in the silent version of "City Girl" (1930) seem to be all that survive today. His best known film is "The Big Trail" (1930) which featured John Wayne in his first starring role. He was fired by Fox along with a large number of other stars as a result of the depression. He made some poverty row pictures and worked for Hal Roach in "The Boy Friends" series. His career was brief with his last film being "The Phantom Express" in 1932. He had 16 features and six shorts to his credit. When he left Hollywood, he went to New York where his singing and dancing talents served him well in two musicals, Cole Porter's "Jubilee" and "Crazy with the Heat." When the latter closed in 1937, he retired from show business. In the ensuring years, he had a ranch in California where he raised a variety of animals, lived in Ohio for ten years, and then returned to California and operated a dog kennel. In the 1990's he was a volunteer with a senior citizens group. He passed away May 25, 1997.